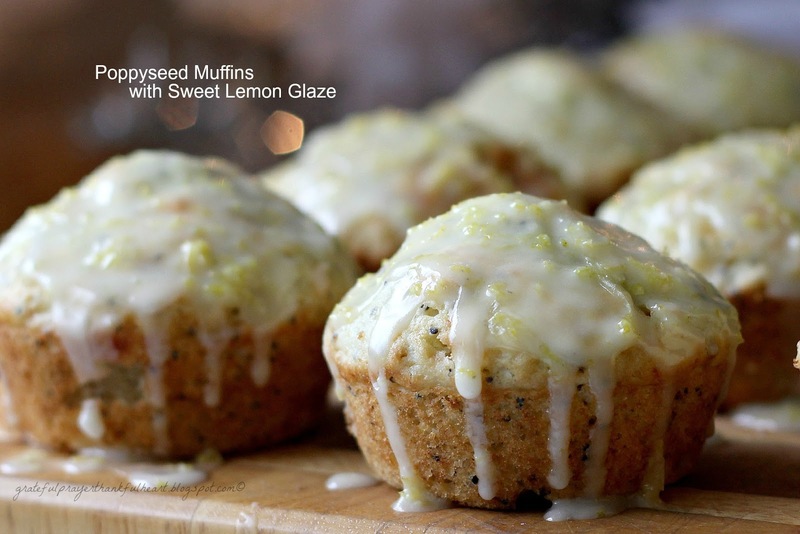 I love muffins and these little gems burst with flavor from a lemony glaze that is both sweet and tart. Serve at breakfast or as a snack. I recently served them as a side with Parmesan Chicken Cutlets. Keeping with the lemon theme, they were a nice accompaniment with the greens and Lemon Vinaigrette dressing. Preheat oven to 400°. Butter standard muffin tin. In a large bowl, stir together flour, wheat germ, poppyseeds, sugar, baking powder, and salt. Set aside. In a small bowl, whisk together the milk, egg and melted butter until smooth. Add to the dry ingredients and stir just until blended. Spoon into the prepared muffin tin, filling each cup about two-thirds full. Bake until a toothpick inserted in the center of a muffin comes out clean, about 15-18 minutes. Cool in the tins for 3 minutes, then remove. Combine all the ingredients in a small bowl and whisk briskly until smooth and well blended. If glaze is too stiff, beat in a few drops more juice. Brush or spoon over muffins while still warm. 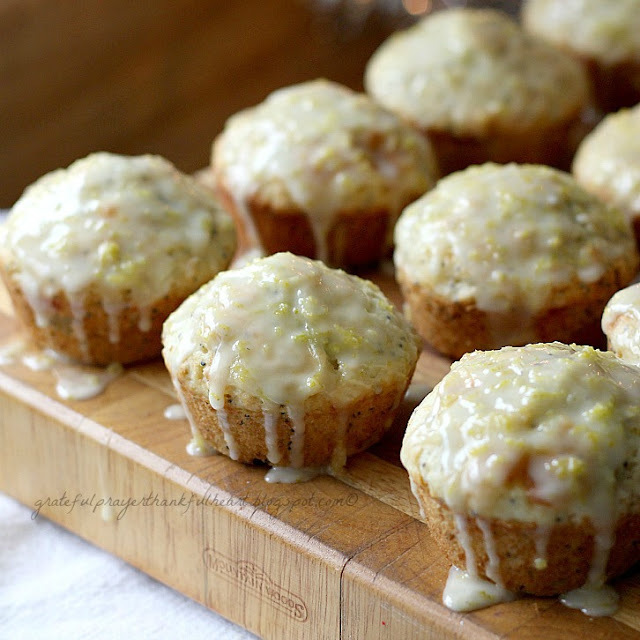 In this early morning hour, with my cup of hot coffee sitting at the desk beside me, you can just imagine how much I would love one of these scrumptious looking muffins to eat right now. Wow! And the recipe provided too. Thank you! 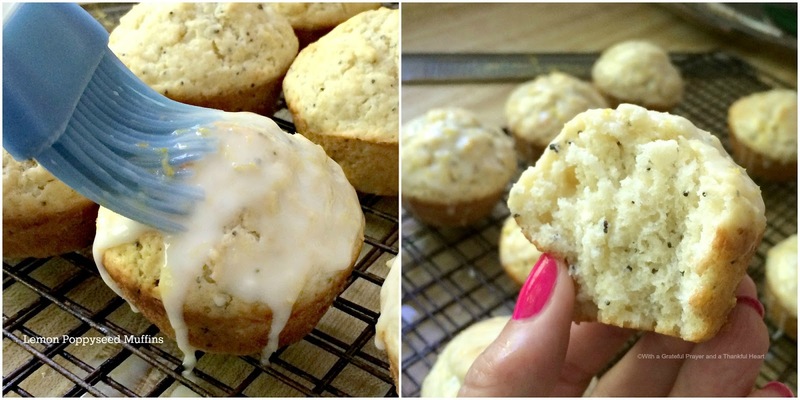 The taste of lemon and poppy seed makes my mouth water. I pinned these and hope to make them in the future. Between my mouth watering and puckering because of the lemon glace my keyboard is damp. How do you make eveything so yummy looking. You sure know how to work that camera. These look gorgeous sweet lady! Thanks for the recipe. PS: Hope you had a lovely 4th. weekend too. These look so delicious and sound yummy. Love poppyseed and lemon together!